Manila, Philippines - The Philippine Atmospheric, Geophysical and Astronomical Services Administration (PAGASA) today, August 19, 2013 at 11:00PM issued update for Typhoon "Maring". 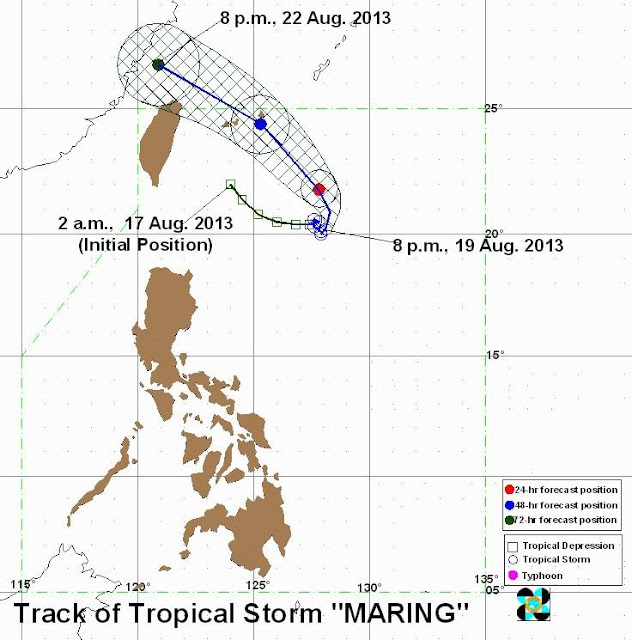 Bagyong “MARING” has intensified as it remained almost stationary, the weather forecast stated. At 10:00 PM today, the center of Tropical Storm “MARING” was estimated based on all available data at 600 km East of Itbayat, Batanes (20.3°N, 128.2°E). Bagyong "Maring" has a maximum winds of 85 kph near the center and gustiness of 100 kph. PAGASA forecast 'Maring' to move North at 7 kph. Tropical Storm “MARING” is expected to be at 560 km East Northeast of Itbayat, Batanes tomorrow evening and at 470 km Northeast of Itbayat, Batanes by Wednesday evening. By Thursday evening, it is expected to be at 595 km North of Itbayat, Batanes or outside the Philippine Area of Responsibility (PAR). Estimated rainfall amount is from 10 – 25 mm per hour (heavy - intense) within the 400 km diameter of the Tropical Storm. “MARING” will continue to enhance the Southwest Monsoon (Habagat) that will bring moderate to heavy rainshowers and thunderstorms over Luzon particularly over the Western section. Fishermen specially those using small seacrafts are advised not to venture out over the seaboards of Luzon due to the possible big waves generated by the enhanced Southwest Monsoon. The public and the disaster coordinating councils concerned are advised to take appropriate actions and watch for the next bulletin to be issued at 11 AM tomorrow.